We rode into Da Lat about two thirds of the way through our trip. I had stumbled upon the city while browsing places to visit in Vietnam online. There was something about the city that seemed to be calling me. I showed Laura some photos I found online, and after promising her some beach days, we scooted off on our little red riding machine. It turned out to be the best decision of our journey, because we spent 2+ weeks here and I really fell in love with the place. 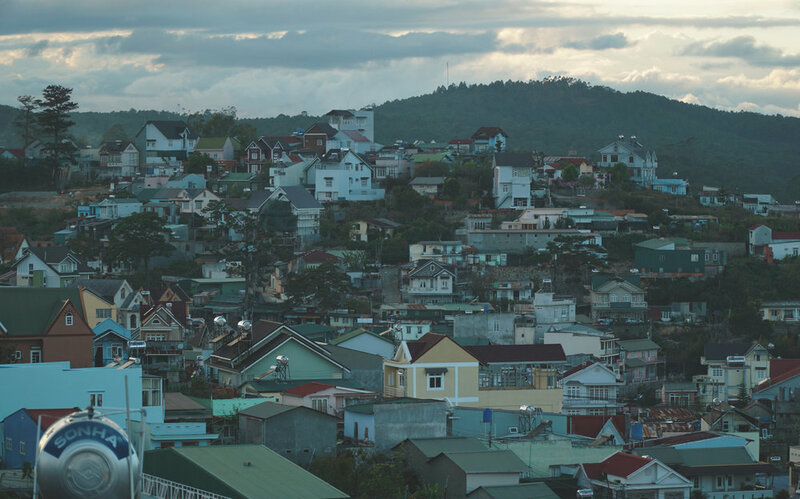 Da Lat is regular sized city as far a population, but far from regular in terms of style. It looks like they took a French chalet town and dropped it right in the heart of the mountains of Vietnam. The city perches on several large hills and crawls into the surrounding valleys. At the center of "downtown" is a beautiful lake, and all around the edges are pine forested peaks sporting lakes, rivers and lots of waterfalls. 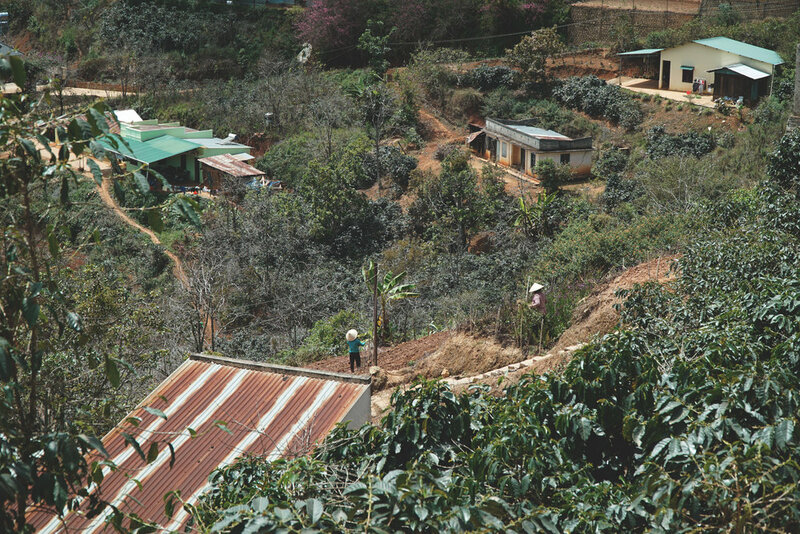 As you move out of the city center, the chalets turn into forests and in between are the most picturesque little farms growing fruits, veggies, and coffee! Every inch of the city is a photographers paradise, from the farms, to the city, to the forests. 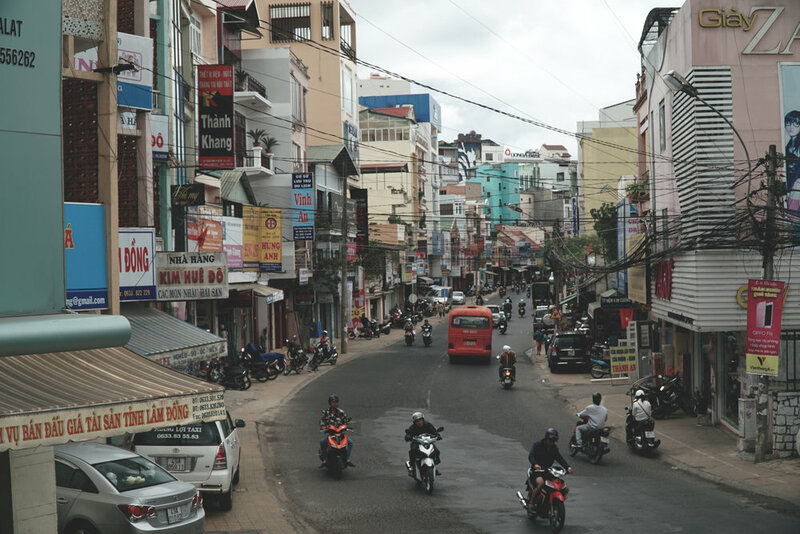 The "downtown" is really quite small compared to other cities in Vietnam, but it lacks none of the luxuries of it's larger counterparts. The hotels are plentiful and well priced. The food is delicious, varied, and easy to find. The majority of tourists in the city are Vietnamese tourists, so the local people are really friendly and kind to foreign tourists. I'm guessing this is probably because they get less visitors overall than the other destinations in Vietnam. After well over a month in the country being constantly bombarded with junk for sale, there is wonderful absence of pushy vendors trying to sell you things. The speed of life in Da Lat is very mellow. Driving is slower, simpler and the streets and highways are much better. We didn't book any hotels in advance on the trip since we had no real plan of where we were going. Da Lat was no exception. This was the only city that proved to be a mistake because when we came into town, towards the end of the day, on a weekend, almost everything was booked already. We ended up staying in three separate hotels while in the city. The first was a budget hotel ($15) across the river from downtown named Khach San Tuan Kiet. It was not my favorite place, but it was clean and nice for the price. The second was an expensive ($35) restored, old French building, called the Duparc Hotel. It was just up the hill from the first hotel. The last hotel we stayed at was a brand new, mid-priced hotel called Khach San Sen Vang which was about a 10 minute walk up the hill out of town. The Duparc was the nicest by far, but definitely not worth the price if you're on a budget. Coffee is a thing in Vietnam, if you didn't know, but the coffee shops in Da Lat were next level. They are something us NW folks should be jealous of. They are vibrant, stylishly decorated and modern. Best of all, many of them are serving locally grown and freshly roasted craft coffee. It's truly a wonderful thing to sip a delicious pour-over after drinking bitter, thick Vietnamese coffees for weeks. My top 3 coffee shops in Da Lat were La Viet, An Cafe and One More Cafe which was also our daily breakfast spot the whole trip (get the banana french toast). Is Da Lat what you think of when you imagine Vietnam? No, not all, but that's the point isn't it? If I knew exactly what I was going to find on a trip, why would I go? To me it's about discovering something new, unexpected and awesome. People always ask, "what was your favorite part of the trip?" and it's usually hard for me to answer that, but not this time because Da Lat really stole my heart. It was my favorite place, and if you make it there you will see why.